Thoughtful readers of poetry are attuned to the musical subtleties of the human voice. These qualities shape the poetry, and most poetry—purely optical or purposely discordant linguistic experiments notwithstanding—should be heard, either as an acoustic mental image, when read silently, or spoken aloud. It cannot be adequately appreciated otherwise. Owing in part to new technology and a renaissance in available arts venues around the United States, the performance of poetry has grown to be a greater concern than it has been for hundreds of years, perhaps since the earliest bards strummed simple instruments and sang versified histories. Poets today have more tools at their disposal than ever before, from the microphone to CDs and digital audio downloads. After America embraced Dylan Thomas’s fiery recitations, which gained legendary status from John Malcolm Brinnin’s equally legendary accounts in Dylan Thomas in America, the notion of the poet as solo performer began to gain greater recognition. Poets in America came to resemble pocket-sized rock stars for a time in the 1960s, shaggy and romantic, visionary, shamanistic, observed as dangerous, even self-destructive—as self-involved and primeval as Jimi Hendrix and Jim Morrison on their swirling psychedelic proscenia. Already by the 1950s, Robert Frost was known for his long reading tours of college campuses. He did a great deal to broaden the possibilities of the poet as touring performer, though the image that remains most irksomely to Americans is the snow-haired old man helplessly clutching his wind-scattered papers at John F. Kennedy’s inauguration; television leaves us with this image, and it is television and recorded music that have done so much to change the role of the poet. Though a few musty recordings on wax cylinder of Alfred Lord Tennyson and Walt Whitman (already very old men at the time) remain to us, the recording of poets was not an archival or ordered scholarly concern until after the Second World War, when the US Library of Congress began to compile recordings of poets as unalike as Gregory Corso and T. S. Eliot. Yale University also assembled a large archive of recorded poetry, and the Academy of American Poets continues to expand its ongoing series of recordings. Caedmon carries a substantial list that includes recordings of e.e. cummings, T. S. Eliot, Charles Bukowski, and Gertrude Stein (though it is rumored by former Caedmon editors that these recordings represent a disappointingly small portion of the total archive, which HarperAudio—part of HarperCollins, part of News America Publishing, in turn part of Rupert Murdoch’s mother ship NewsCorp—should make available for purely scholarly if not entirely commercial purposes, if they have not already done so). Aside from exceptions like Dylan Thomas’s A Child’s Christmas in Wales LP from Caedmon, it was only in the late 1980s and ’90s that recorded poetry was viewed as an even remotely profitable branch of the entertainment industry, and while a handful of recordings, such as those by twin hipster icons William Burroughs and Kurt Cobain, gained respectable sales at the time, it is still shaky ground for the would-be record company or publisher. Star power is often called in to brighten up the grayish literary bits pulled off the shelves: Johnny Depp reads from Jack Kerouac, for instance. Also, the poets and writers that tend to sell most vigorously in recorded form are those who fit into the “Redskin” (as opposed to “Paleface”) grouping as established by Philip Rahv in his 1949 essay. The “outlaw” element of American poetry—which owes its outlook and popularity more to authors’ lifestyles than any consistently recognizable poetic or prose style—is generously in attendance, possibly because they settle so snugly with the ranks of outsider rockers (some are, in fact, more rock stars than writers): Patti Smith, Kathy Acker, Ani DiFranco, Maggie Estep, Laurie Anderson, and their earliest American font of ferocity and fume, Walt Whitman. Most of this is classified as “spoken word” (opposed, one is forced to assume, to “read word”), and this is fine, of course, but those writers who receive shortest shrift in the equation are those whose formal elegance and ready craftsmanship would most benefit from being heard. They might be “Palefaces” or not. More likely, the greatest difference, in real terms, is that they have fewer tattoos and don fewer articles of worn denim. Outside of “slam” poetry and other demimonde venues, which rarely yield mature contributions to the literature, most American poetry has fallen rather far from its song-like origins in Ancient Greece and elsewhere. Ezra Pound’s excavation of the Provençal troubadour ballads did a great deal to inspire other poets of his time, even as modernist experimentation, often allied or prodded by progressive trends in the visual arts, was slipping further from the rigidly scanned lyrics used by Victorian educators to encourage elocution and memorization. 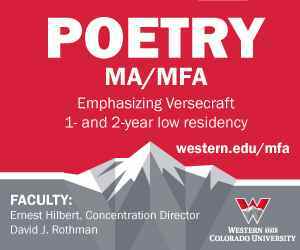 In a strangely inverse proportion, American poetry since the 1960s has come to rely in ever-slighter quantities on measure and rhythm while readings have become increasingly popular. One problem presented by the semi-professional need for poets to deliver recitations of their poems is that it must be assumed that they are the best interpreters, if not necessarily the most gifted performers, of their own works. One might delight in the thought of James Earl Jones intoning one’s poem from the podium to awed audiences, but it is usually a whinier, less assured voice that the audience finally encounters. It is unfortunate that the aural revelation of a poem is often one of foggy meandering and droning rather than the warm illumination that should be expected. One finds in scratchy old recordings of Pound reading from the Cantos a tidier (or at the least quite amusing) understanding of some of the last century’s most imposing and sometimes nearly incomprehensible poems. Even an otherwise undemanding poem by a poet today will be muddled up in the reading. The poet very often recites with a slight trailing up at the end of the otherwise randomly broken line, in a pompous, breathy seriousness that hardly befits the slightness of the poetry itself. One motivating aspect of the contemporary reading circuit is the exposé of a poet’s personality and presence. Fans once jostled for a glimpse of T.S. Eliot and clambered on shoulders for a peep at white-robed Allen Ginsberg. It seems that everyone who ever stood in a room gripping a sweating cocktail beside the previously invisible Sylvia Plath has been compelled to set their experience down on paper. The listeners gather in dusty theater or sticky-walled bar to get at the source of the books on the shelf. They come to witness greatness, fame, and finally, the clarification, elucidation of the poems, the revelation from the oracle. Some recordings forever color future silent readings of the written works. A brief minute of W.H. Auden’s amiably avuncular voice will allow one to hear him mentally every time the books are opened again. Recordings, when available, are essential complements to the pages we read, and we are indeed lucky to live in a time when more and more recorded poetry is becoming available. The dashing British critic Jon Stallworthy has frequently acknowledged that poetry, in its written form, is akin to a score for music. He points out that the principal divide between prose and poetry is the sound of the language. Poetry is an art form that places a high value on rhythm, rhyme, accent, alliteration, and other strictly aural facets of a given language, creating what Kenneth Koch terms, after Paul Valéry, a language within a language. Just as painters (another endangered species) use color, line, form, depth, figure, lighting, texture, and framing to achieve their visual affects, poets are at their best when they make use of the basic constructive elements of their own medium. It stands to reason, then, that even when silently reading poetry the reader is keenly aware of its musical qualities. To hear poets reading their own works in recorded form is a benefit we in the twentieth century have over previous ages. Random House’s Voice of the Poet series is one of the finest contributions to this field. Combining audiotapes and CDs with pocket-sized books, they are a welcome addition to the serious reader’s bookshelf. Originally, and for many years, they were only available on cassette tape-an already largely obsolete analogue technology, though these recordings still persuaded listeners to blow the dust from their old players. Now available on CD, the next logical move would be to step out of this already drying technology stream and dive into the coming waves of purely digital file sharing. Let young readers discovering Sylvia Plath download ‘Daddy’ from Napster or Morpheus for their iPods. Until then, the CDs and tapes will surely suffice, not least because of the lovely books that accompany them. The series covers many of the most famous English-language poets of the second half of the twentieth century, including W.H. Auden, John Ashbery, Anne Sexton, James Merrill, Robert Lowell, Elizabeth Bishop, and Sylvia Plath. These recordings join the two principal uses and considerations of recorded poetry-they are both historical artifacts and enjoyable listening experiences. J.D. McClatchy has written helpful original introductions for each poet, and has selected both boldly representative and intriguingly rare poems from the archives made available to him. have consented to die. . . . In Auden’s hands, the poem is more than the cry of its occasion.